My friend suggested a drive out into the Yorkshire countryside and a visit to Ripley Castle. Ripley is situated 3 miles north of Harrogate. It is also the preferred starting point of a 53 mile circular walking trail known as ‘The Nidderdale Way’ which passes through some delightful Yorkshire beauty spots including Brimham Rocks. We managed to find one of the few remaining spaces in the village car park from where there are beautiful views of both the castle and the Nidderdale valley. The village is based on a French model village and has some delightful old stone architecture. It is the only place in Britain to have a ‘Hotel de Ville’ instead of a Town Hall! There’s a cobbled market square with a war memorial, market cross and village stocks. In case you might be wondering what ‘stocks’ are – they were used as a form of physical punishment involving public humiliation. The wooden stocks partially immobilised its victims and they were usually to be found in public places such as market squares. Facing the square is an old coaching inn, ‘The Boar’s Head’ which is one of the Great Inns of Britain. 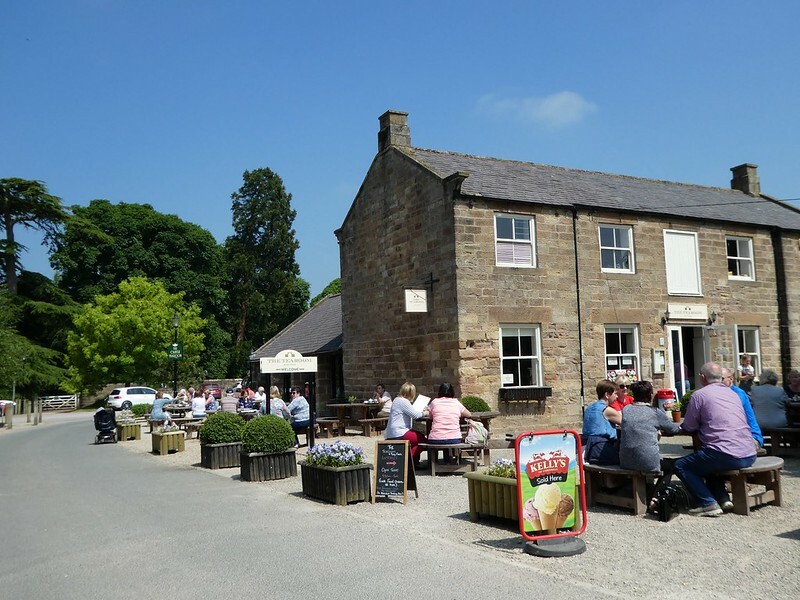 This inviting hostelry serves local ales, bar snacks and full meals and there are several rooms for overnight stays. The village school, Ripley Endowed was founded in 1702 and rebuilt in 1820 and is set back slightly from the main road. Wouldn’t you just love to have attended a primary school like this? I certainly would! 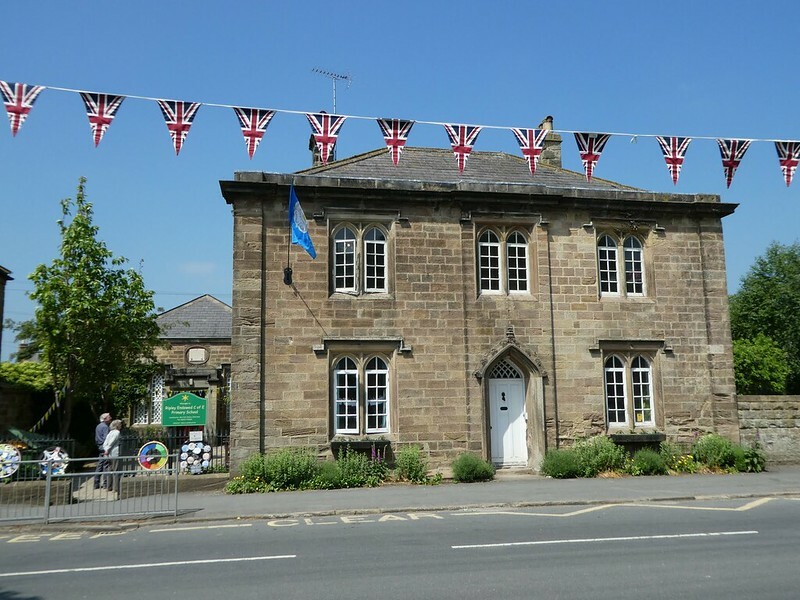 The population of Ripley is approximately 260 and it’s a thriving community with a parade of shops, all fashioned from old stone cottages, these include a post office, traditional butchers, general store and an ice cream shop. 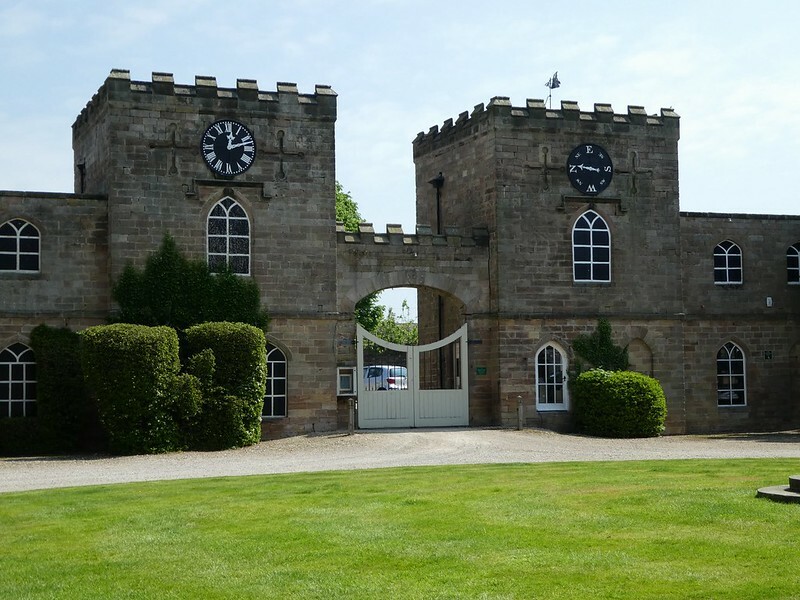 It was then time to visit the castle and gardens comprising the Ripley Castle estate. The Ingilby family are one of the ten oldest families in the country still occupying the same residence (700 years in 2009), the castle having belonged to the same family for 26 generations. Stepping through the ornate entrance gates we marvelled at the ancient castle with its large lawned estate stretching out as far as the eye could see. A guided tour of the castle takes 45 minutes taking visitors through the formal rooms and ending in the Knight’s chamber. We then followed the terrace around the castle to reach the Lakeview Path leading to the Lakeside Walk. It takes around 30 minutes to take this circular walk which leads over the waterfall bridge to the deer park. We didn’t spot any deer on our walk but we did see some ducks, geese and a heron as we strolled along. Some of the ancient oak trees are over one thousand years old and these have such a wide girth and gnarled branches but still looked healthy. We then explored the walled gardens which have huge herbaceous borders which were a riot of colour. 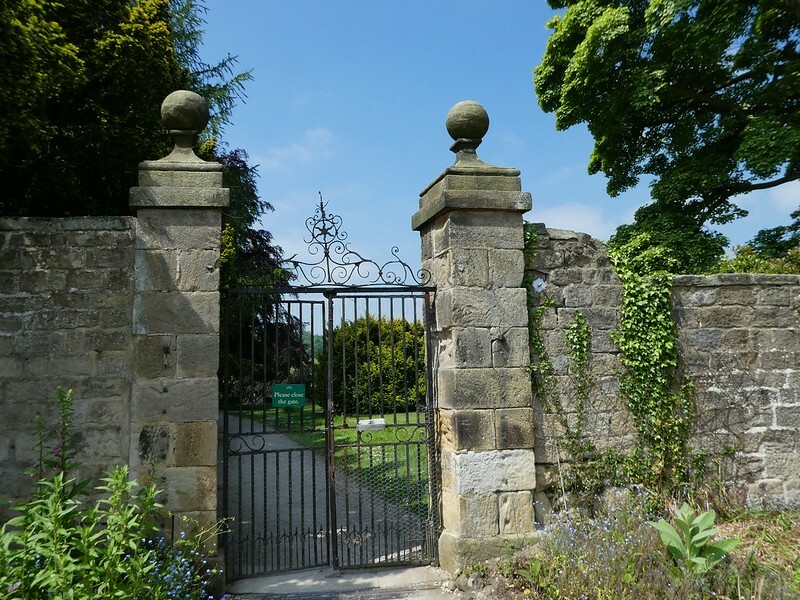 Ancient wisteria and clematis cling to the south facing stone walls whilst the herb garden contains both culinary and medicinal herbs all beautifully labelled using old stone signs. Our tour then took us to the glass houses which contain many specimen tropical plants, ferns and cacti, most of which had been labelled for ease of identification. Before leaving we visited the Castle tearoom which serves a good selection of scones, cakes and cooked dishes. As it was such a nice day most people were sitting outside enjoying the warm sunny weather. 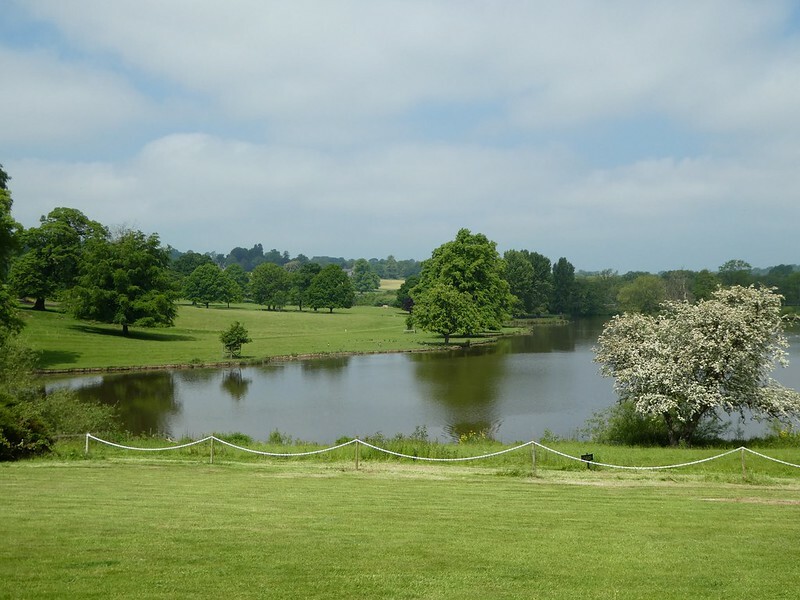 The end of a lovely day out in Ripley, if you are just visiting the gardens admission is free on weekdays. More details can be found here. Thank you for your kind words. I hope you get an opportunity to visit this beautiful small village soon. Thank you for taking an interest in this post. Ripley Castle is a lovely place to visit. Yes it looks very interesting. wow, really beautiful and wonderful sights. Thank you, Ripley is really beautiful. I’m pleased you enjoyed reading my post. Ripley is really beautiful in the summer months. Thanks for your much appreciated comments. Love this! I used to live right outside Harrogate. My favorite place in the whole world. Thank you for your kind words. Harrogate is a delightful town and I love visiting there. Did you manage to have an icecream? I grew up in Killinghall, which is down the road. Ripley will always have a place in my heart. Such a beautiful little place! I love reading your blog, felt like I was travelling with you =) I’m always looking forward to the places you’re visiting. Such lovely comments for me to read over my breakfast! I’m so glad you are enjoying reading my blog. Hi! would you know if the castle is open during winter as well? thanks! I believe it is open all the year round. Thank you for your comments. Thank you! It really is lovely. Thank you, it is really lovely there. So beautiful! I can only imagine at night how creepy it must look though, love it. Haha. It was really beautiful but I think it’s a bit big to live in! We’re heading to Harrogate late July – definitely adding to our list! That’s good to hear! Harrogate us one of my favourite places in that area too! Looks gorgeous. Interesting read, especially about the long history of the family. Thanks Martin, it really is a gorgeous place. Thank you for sharing! I’m going to add this to my travel list! That’s good to read. I hope you get an opportunity to visit soon. Thank you Dani for your much appreciated comments. I can’t believe the age of those oak trees! That’s incredible. Yes it’s hard to believe that they could survive so long! Great shots of the architecture and area. So much beauty there. Thank you, we are fortunate to have such scenic places to visit not too far away from our home. Love this area and enjoyed the blog – please may I reblog it? Thank you for your kind words. You may reblog my post. What a lovely place to walk. Thanks for bringing us along with your story and photos. It’s my pleasure, it’s good to read that you enjoyed my post. Sounds like a great little village. Love all of the stone buildings! 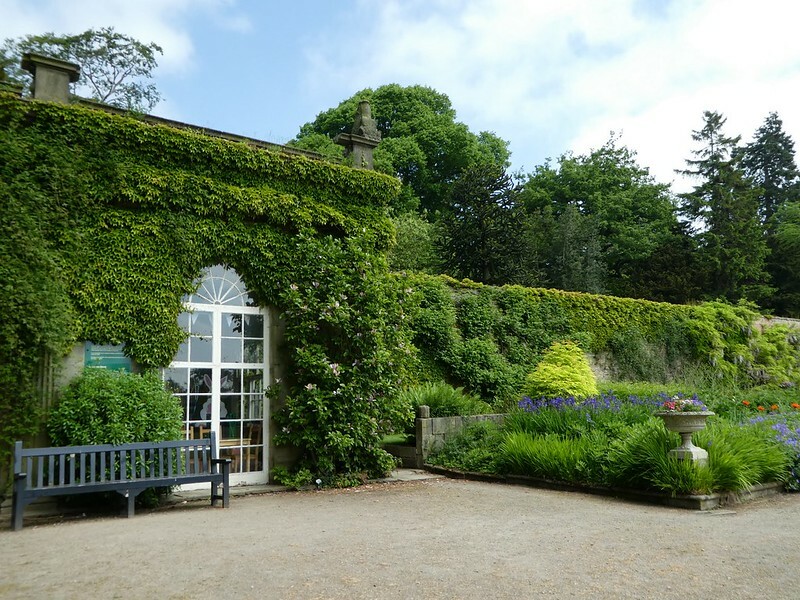 And, those gardens…..
It’s great! Thanks for your welcome thoughts. Thank you for your comments, it is a lovely place. I can just imagine people living like this. Sooooooooo tranquil. That’s a life, I suppose, just might be gone forever. Too bad but things do change–sometimes for the worst. Great post. Take care. Yes it’s quiet village life in rural England, blissful! But I like a mx to f rural and urban life! Thanks for your kind words. looks like a charming village. 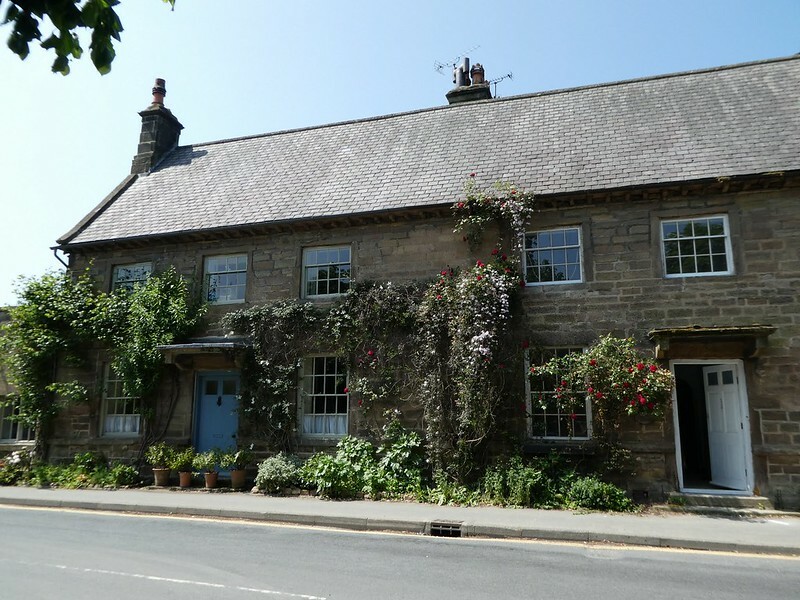 We went to hike in the nidderdale valley but we didn’t stop by Ripley. The Nidderdale valley is very scenic. Perhaps next time you could visit Ripley. Awesome old architecture and beautiful landscapes. I love the lake photo very much. Thank You for this post. It’s my pleasure. Thanks for your kind words. Beautiful pictures! Somehow, I still have not been to England, but it is on my list. Ripley Castle Gardens and the village look lovely. Thank you for your interesting thoughts on my Ripley post. I hadn’t heard about that, it’s fascinating. Thank you for this interesting information about Oliver Cromwell. Absolutely gorgeous…love those old homes. Thank you Sue! Perhaps you’ll get an opportunity to head north! A beautiful village Ripley and you drove me to this place .A great place to live and die in the cool green verdure of the place. Keep up this great voyages. read my blogs as well. Thank you for your kind words, I’m so pleased you enjoyed reading this post. I couldn’t agree more Ian, it’s delightful!